The Super Bowl arrives at the end of this week. 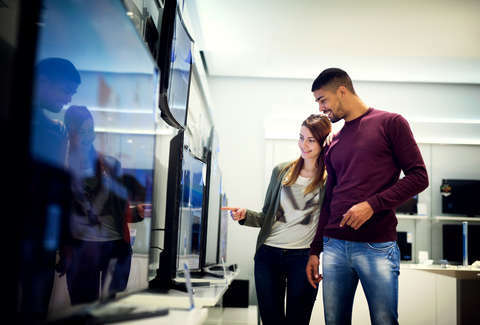 The year's most-watched television event -- often more than doubling the audience of the second-place finisher -- is an occasion where many people feel the urge to buy things. Things like an obscene number of chicken wings, all of the liquor store's beer, and TVs. Yes, TVs. It's a good time to trade in your jalopy for the latest model. Rather, for last year's model. While many TVs are at their cheapest around Black Friday, just before the Super Bowl is the second cheapest time of year to get a new television. There is historically around a 22% drop in prices, according to data compiled by Consumer Reports. Moreover, the Super Bowl takes place shortly after the Consumer Electronics Show, where companies show off their fanciest new models. You know, the ones that offer foot rubs to your guests and throw a pizza in the oven when it realizes you're nine episodes deep into a serious binge-watch of The Office. Immediately after the debut of the latest TVs, last year's models get a price cut. So, sales are going on, and the high-end models from last year are often seeing a sudden price drop. With that in mind, here's a look at some of the best TV discounts available in the run-up to the Super Bowl on February 3.